Home Latest News Polisario: Will Brahim Ghali Cancel his Trip to Spain? Polisario: Will Brahim Ghali Cancel his Trip to Spain? The new leader of the Polisario seized the opportunity of a conference, to be held in November in Barcelona by a so-called “European Coordination” for solidarity with the Sahrawi front, to reveal his intention to go to Spain. Yet, the hidden purpose of the revelation was to test the judicial authorities of the European country where penal proceedings are pending against him. His manoeuver is obvious. Brahim Ghali wanted to take the pulse of Spanish authorities, as legal action is being taken against him by Audiencia Nacional [Spain’s National Court] since 2008. And the charges against him are far from being minor. The Polisario leader is sued for torture, forced disappearances, illegal detention and serious violations of human rights. All these serious crimes were committed at his orders, in the Sahrawi movement’s headquarters in the Tindouf camps in Algeria. The case dates back to 2008 when Sahrawi victims filed a complaint against Brahim Ghali, then Polisario representative in Madrid. 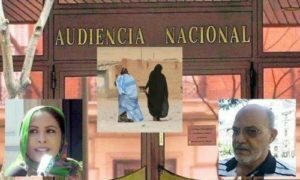 He has been summoned by the Audiencia Nacional to answer for these crimes, committed when he was at the head of the Polisario armed militia between 1976 and 1989. Brahim Ghali did not show up at the hearing before the Spanish National Court, empowered to rule on crimes committed outside the Spanish territory under the law of universal competence. But the victims appeared before Judge Pablo Ruz and made heartbreaking testimonies about the abuses and violations they were subjected to in the Tindouf camps, along dozens or rather hundreds of other Sahrawi prisoners. The physicians who examined the complainants confirmed they were bearing signs of torture and abuse. After the start of these legal proceedings, Brahim Ghali left Spain and returned to Algiers where he was appointed ambassador of the Polisario. He held the position until the death of Mohamed Abdelaziz and his appointment as head of the Polisario at the instigation of Algiers. In the meantime, the Spanish judiciary had launched an arrest warrant against the former Polisario representative in Madrid. Today, Brahim Ghali, as Polisario Chief, tries to obliterate this embarrassing episode and hints that he will be going to Spain. But will the Spanish Justice forgo the complaint still pending against him?